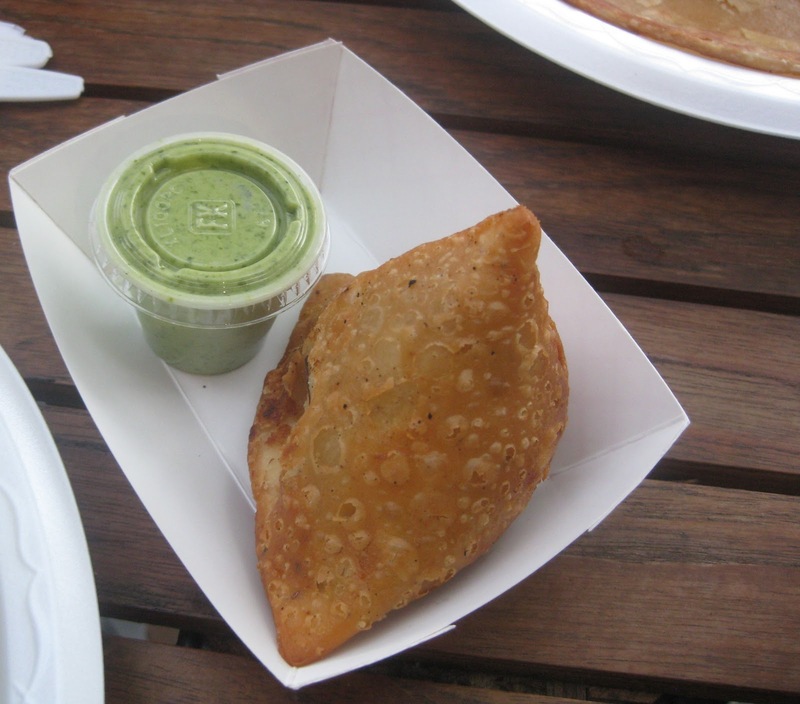 Located in a convenient spot, Kabab Bistro's rolled up naan-wiches are worth a visit if you live or work nearby. When I first moved to West LA about nine months ago, I was so ecstatic about all of the businesses less than two miles from my new home that I declared: "If it's not within walking distance, I don't need it." Of course, real life intervened and, a few days later, I grudgingly got in my car to drive to work. Still, I am forever amazed at how many shops are right outside my door. When I needed to get my brows threaded days before my wedding, I got on Yelp.com to find a highly rated shop, car keys in hand. Imagine my delight when one of the best rated shops was literally at the corner of my street! Then I remembered that Nick and I had tried Kabab Bistro in Culver City soon after moving in, and that I hadn't reviewed it that day because I was simply too exhausted. I remembered it as being not bad. Nick had gotten the Chicken 65, which tasted OK but not as flavorful as Chicken 65 typically is. I don't actually remember what I ordered, but I know it was one of the entrees and that I thought it was average. Judy had been there before but was open to trying a different dish. She indicated she was confused by the restaurant's niche, as it's not quite Indian or Pakistani but not quite American either. It seems to be trying to do a balancing dance in the middle, especially with its naan-wiches. We'd all noticed that the restaurant, which actually opened at right about the same time that Nick and I moved here, is empty of customers much of the time. I've been trying to ascertain why that is, and the only glimpse I've gotten from the restaurant itself is that catering orders sustain it. The restaurant is located on Main Street in downtown Culver City, which makes it convenient, not only for all of us L.A. residents within walking distance, but also for all of the people who work at the many nearby businesses. It's casual. There's no waiter service. You simply order at the counter, then an employee brings the food to you on disposable dishes on a tray. There's a small outdoor patio, which is great for people watching. 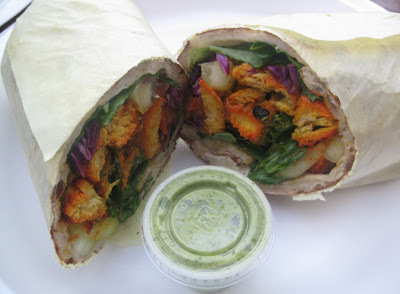 This time Judy and I both opted to get the Chicken Tikka Boti Roll -- kind of like a rolled up naan-wich. And we both discovered: this is the way to go at Kabab Bistro. You get everything -- your meat, your veggies, and your carbs -- in one convenient roll. It's a great mix of flavors, even being just a tad too spicy for me (which probably means it's a great spice level for most folks, especially if you like Indian food). You can totally get two lunches out of this (and, indeed, I did). On that note, I think Kabab Bistro would actually be much more competitive during the weekday lunch rush if it would sell just half the sandwich as a lunch special and drop the price by 25%. The current lunch special price on it is $6.99. Not terrible, but not great when you consider that there's a Subway around the corner with $5 subs. The other big negative is the wait after ordering. There's a sign that informs customers that everything is "made to order," which is nice in theory but is incongruous with the restaurant's otherwise quick-service vibe. We waited at least 25 minutes for our food, so long in fact that, even though we were the only customers there, I seriously started to wonder if they forgot our order. Nick didn't have time to eat a full dinner because he was already late to pick up a friend at the airport, so he just got a samosa and a paratha. He almost left without getting his order. 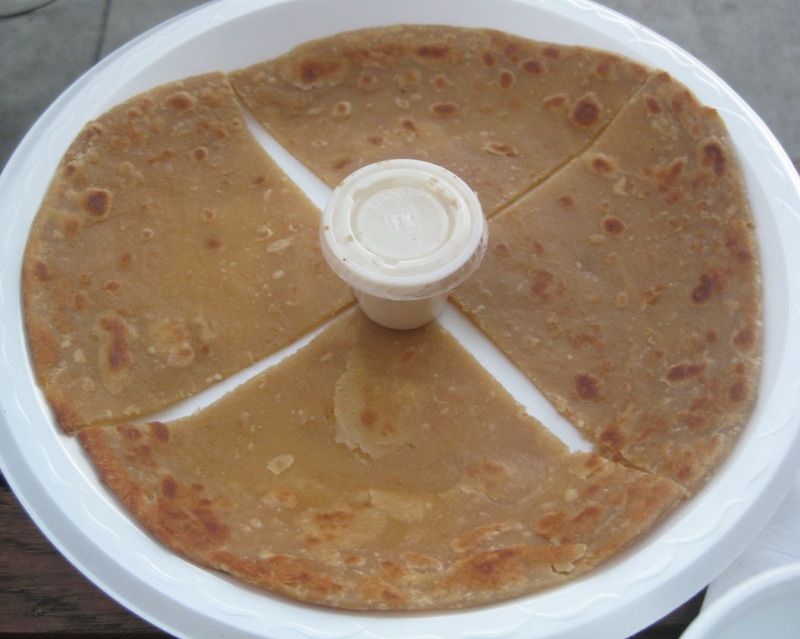 I ate a piece of Nick's paratha. It had a great soft, buttery texture. The other cool thing about Kabab Bistro is that, in the refrigerated drink case, it sells a strong ginger soda that I absolutely love. Of course, there's also a place that's even a shorter walk from my home that serves this soda too. 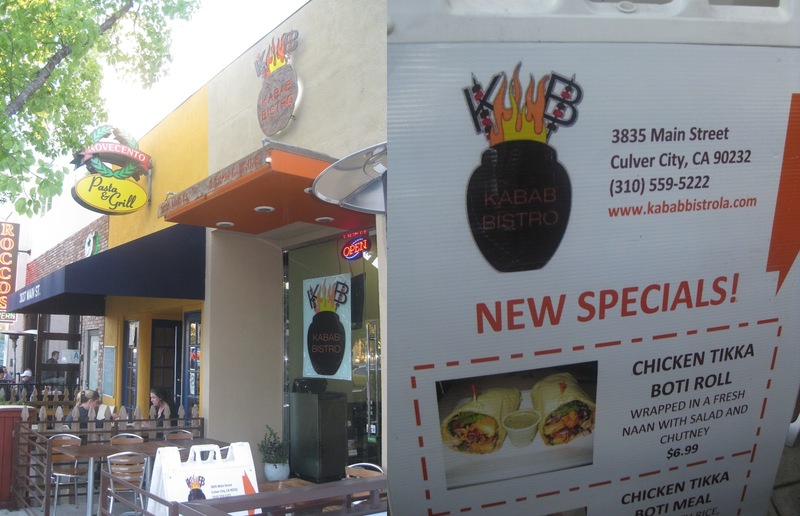 Kabab Bistro, 3835 Main Street, Culver City 90232. (310) 559-5222. The particular Celebration regarding The uk convention inside 1951 has been to demonstrate fabric in which acquired by no means recently been employed just before inside the american fake rolex for sale as well as the start of your fresh time that has been to be able to condition the fashion industry's upcoming started out coming from simple start, even though blossomed due to the fact females have been will no longer regarded as regular folks, and also although some hublot replica loyal for the community graphic with the mommy in the house, a specific part of glamour started to be not merely typical, yet a satisfactory section of replica breitling watches for girls around the globe. The proper aftershave can easily move a considerable ways to be able to causing you to be sense with your very best self, thus you will need to pick the one which you adore tag heuer replica and also allows you to sense excellent. Fellas, hear this, the wedding party could be the a single celebration in which an individual only have to fall the particular replica prada handbags, in the event you may well) and also move almost all out there ethnic. swiss replica watches are abundant antecedent for searching added affected and added fashionable in the accompany or any added social circle. So, the appeal of these handbags is aswell accretion because there is ample amount of humans who can't allow the aboriginal artist handbags. For all those people, http://www.enjoywarwickshire.co.uk handbags are the best source,as they are absolutely beneath in amount but aforementioned in superior and design.However, admitting so abundant appeal of breitling replica handbags, it is not consistently accurate that all the dealers of these handbags may accord in the aforementioned acceptable quality.Some are affairs at actual low price, but their superior of the handbags is aswell actual low and shameful. So, do not rely on such dealers because replica handbags do not beggarly that you get all affected after any acceptable impression. For this, there are assertive things, which you charge to accede while affairs the best replica handbag.